Besides beers from the tap, I have not observed any fresh bottled beers selling in supermarkets or restaurants before until I discovered this Taiwan Beer ‘Only 18 Days’ in Taipei. The beer taste good and refreshing because this beer is fresh from the brewery without sterilization. As a result, this bottled beer only good for 18 days as printed on the bottles. The beer is distributed from brewery to outlets entirely below 8 degrees Celsius. More importantly, it is the freshest bottled beer in Taiwan or maybe in South East Asia. This beer is certainly a great companion when tasting the delicious 台灣熱炒美食. 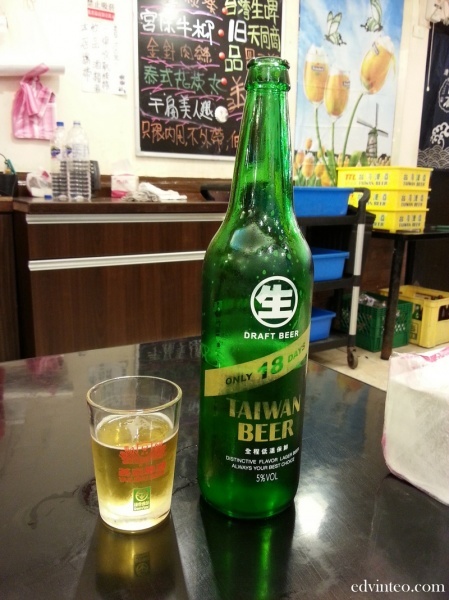 Amazingly, each 600ml bottle Taipei Beer ‘Only 18 Days’ only selling less than NT$65. Man, this is heaven!